The aquatic world is full of many beautiful creatures that prick the interest of anyone who takes pleasure in exploring nature. One of such creatures is the dwarf crayfish with the biological name,Cambarellusspp.There are many varieties of dwarf crayfish and it is majorly classified based on the size and color. Notable examples include C. ninae(brown-colored),C.montezumae(yellow-colored), C. patzcuarensis(Mexican ‘orange-colored’ dwarf crayfish), C. shufeldtii(Cajun ‘grey/reddish brown-colored’ dwarf crayfish) to mention just a few. The Mexican dwarf crayfish and the Cajun variety are the most commonly kept of the lot. They are known to have a relatively small body structure, and they can only grow to a maximum length of 50 mm. They possess 19 pairs of limbs and they use this for functions such as moving from one spot to another, an assistive organ for feeding among other purposes. Dwarf crayfish is native to NorthAmerica; you will find them in abundance along the coasts of Mexico and Southeastern USA. But they can also be seen in other countries like Australia and the Netherlands. They are found dwelling in slow-moving, rivers, lakes and streams. Owing to the tendency to go into hiding, dwarf crayfish love to have holes around their habitat. The need to go into hiding may be due, in part, to the fact that the usually molt – this leaves them in a vulnerable state –on regular basis hence they require some sort of protective cover. As a matter of fact, young dwarf crayfish molt between 3 – 4 times weekly while the older ones only do so about twice every year. Molting is yet important for them as it is the only way through which they can replace lost limbs. After the dwarf crayfish must have molted, you will certainly see their empty shell at the base of the aquarium. You do not necessarily have to get rid of this (shell) as it can serve as a rich source of calcium which the crayfish can feed on in due time. In terms of feeding, dwarf crayfish can feed on virtually anything they deem edible. They are primarily known to be omnivorous, although they may sometimes exhibit scavenging inclination. It is yet worth noting that dwarf crayfish are bottom feeders. They feed on vegetables [such as carrots, squash, broccoli, etc], pellets, dried leaves, brine shrimp, mosquito larva and soon. Additionally, in the event of molting, it may be highly essential to supplement their diet with a rich supply of calcium and iodine – this is where grounded eggshell, potato skin and frozen blood worms – become very valuable. This helps to enhance and/or speed up the formation of new shell. On the whole, they should be supplied with a moderate quantity of feed once every day.You should however be careful with the amount of feed you drop into the aquarium or breeding tank in order to prevent and/or limit the incidence of the water getting turbidon frequent occasions.Putting in so much at a time can increase the organic load in the tank, and this could subsequently cause oxygen depletion. Dwarf crayfish do have a wide variety of feed that can give them the required nutrients but feeds containing copper sulfate should be avoided as much as possible. For one, copper sulfate is toxic to them, and it could negatively affect their growth and reproduction. About 1 – 2 weeks after mating successfully, a couple of dark-coloredfertilized eggs – about 20 – 60 pieces – is laid. These eggs are carried within a pouch present around the pleopods of the female who conscientiously nurtures them as the hatching period beckons. At this point, you will see her using the swimmerets to get water over the eggs in an attempt to rid them of dirt. Miniature dwarf crayfish are expected to emerge from the hatched eggs.It takes about 3 – 4 weeks for the eggs to hatch.The babies should reach maturity within 3 – 4 months. On the average, the lifespan of a dwarf crayfish is 1 – 2 years. It may interest you to know that male and female dwarf crayfishmate with their bellies facing each other as the male maintains a dominantposition, having a strong grip on the female. This (mating) could go on for close to 20 minutes or thereabout, and ends with the male depositing sperm [to fertilize eggs] in the stoma of the female. By the way, you can easily distinguish between male and female dwarf crayfish by looking at the pleopods. The pleopods are the 5 pairs of limbs that are fused to the abdomen. The first pair of pleopods on the male is rigid while that of the female is soft and not much different from the remaining (four) pairs.To sound a note of warning: it is not advisable to put the babies up with other animals as aquarium mates; this isto keep them from being preyed on. Dwarf crayfish seem to have a simple lifestyle; maybe it’s best to surmise that breeding them is a semi-intensive exercise. Be that as it may, they are generally regarded as peaceful animals – hardly will you see them showing any form of aggression. They are definitely not like most of the other crustaceans. Another behavioral trait that is often linked to them is the leaning towards staying in isolation as they can ‘hole up’ for months or even years in their natural habitat. This does not however necessarily mean they are solitary animals. Again, that dwarf crayfish are peaceful or easygoing does not equate to them not being able to defend themselves in the event of attack. They would readily raise their pincers to fend off attack – or they could just dash away from danger zone. Although dwarf crayfish are not so tough to keep; it is important that you provide them with certain basic necessities. In this wise, you have got to understand that dwarf crayfish are freshwater animals hence they should be kept in an environment (that is, aquarium or tank) that mimics their natural dwelling space – we shall see more on this under tank setup. Dwarf crayfish thrive in a water body with a pH value of between 6.5 and 8.0, and a temperature of 21°C – 26°C. Water with high mineral content – talking about hard or medium-hard water – is beneficial for the formation of their exoskeleton. Dwarf crayfish may not survive for so long in soft water. As oxygen is essential to human life so it is to dwarf crayfish – or maybe even much more considering the fact that they do not always venture to the surface to get oxygen. Owing to this, you should ensure that the tank as a functional aeration system, and that the temperature is maintained within the required range. In order to avoid making assumptions about pH and temperature ranges, you should get devices such as pH meter and thermometer to check measurements regularly. Having adequate amount of dissolved oxygen in the water will help keep hydrogen sulfide concentration within negligible range in the aquarium. Here is one thing you need to know: markedly high level of hydrogen sulfide will not only contaminate the water but could also immobilize dwarf crayfish and lead to its eventual death. N.B: You can use limestone or eggshell to safely raise the pH level of the water if it falls below the required range or decrease it using pretreated almond leaves or driftwood if it is well above range. You should do this adjustment with the aid of a pH meter. Another aspect you need to pay attention to is the concentration of nitrite and ammonia in the water as dwarf crayfish do not usually find them friendly. These two compounds are generated as a result of the decaying activities of organic matter and the deposition of feces [by animals inhabiting the tank] into the water. Leftover foods in the tank can also contribute to the levels of ammonia and nitrite in the tank. Besides being toxic to the crayfish, ammonia and nitrite can also hasten the depletion of dissolved oxygen and markedly increase the pH level; a situation that is detrimental to the health of these wonderful creatures. Now, how do you know if the water is having excessive amount of ammonia? The best way to do this is with the aid of a test strip, you can get one from the store. Ammonia, being colorless itself, may not change the color of the water even when it is available in huge amount. It will however cause a burning sensation on the skin – the soft tissues of the dwarf crayfish so to say. Summarily, water quality, pH and oxygen levels and temperature are 4 essential elements that should not be overlooked when raising dwarf crayfish. These factors are necessary for their growth, reproductive health and overall well-being. The water should be changed regularly, probably once every one or two week. This is crucial as dwarf crayfish often give off a lot of waste. As you already know, hiding spots are highly valued by dwarf crayfish so you should ensure that they are well provided in the tank. You can do this by placing clay tubes, stones/gravel, leaves, hollow roots, water plants and some other relevant items at strategic point in the aquarium. Another feature that should not be missing from the tank you will use in housing your dwarf crayfish is a good filtration system. Therefore, if your aquarium does not have one you should see to it that one (filtration system) is worked into the tank before putting in the crayfish – a sponge filter should be perfect. The sponge filter will help prevent your dwarf crayfish from getting sucked into the filtration unit, and it also provides the area where beneficial bacteria [that aid in curtailing the accumulation of ammonia] can grow. Another edge sponge filter has over other types [of filter] is that it is easy to use and maintain. Size: The size of the tank to use will be determined by the number of pets you intend to keep therein. A 25-liter tank should be ideal for housing one dwarf crayfish. However, you will have to consider getting a larger one if you intend to have more than one crayfish or house it with some other animals. Placement: A lot of people may not give much attention to the position of the dwarf crayfish’s housing (tank) but for anyone who wishes to give his or her pet a ‘good life’, this is equally important. Aside being peaceful creatures, dwarf crayfish love having it (their environment) dark – they even somewhat more active at night hence the reason why they are often describe as ‘nocturnal’ animals. As a result of this, it is recommended that you position the tank in a spot where there is enough shade, maybe around the corner of the room and away from direct sunlight. This singular act could ensure that they are not stressed beyond measure especially in the moment when they are undergoing molting or mating. The truth is that they do not like being disturbed. So, it’s best to just keep the lights out. As earlier emphasized, the average lifespan of dwarf crayfish is 1 – 2 years but this could be cut short by certain (diseased) conditions. And just to mention; they are prone to injuries most particularly during and after shedding off their shell (i.e molting). Having said that, we shall now take a look at a number of diseases that can hamper the health of dwarf crayfish. 1. Crayfish plague: crayfish plague is a common, and sometimes lethal disease that do affect North American dwarf crayfish – and even freshwater crayfish in general. The disease is caused by a fungus – water mold to be precise – known as Aphanomycesastaci; this microscopic fungus is known to thrive in freshwater. Besides the direct transmission of the disease that can occur when dwarf crayfish come in contact with the fungus, they can also get infected through dwelling in and/or drinking contaminated water into which the spores of A. astacihad been discharged. Symptomatically, the tail muscles of the dwarf crayfish that has been infected with the fungus may become brownish-red or white; black spots may also be seen on the dorsal section of their outer shell. Plus, they begin to show some unusual behaviors like frequently staying in the open, away from their hiding spots and moving in an uncoordinated manner. Unfortunately, no cure has been found for this disease, and it has caused the death of many crayfish. Death usually occur after a few weeks of infection. 2. White spot syndrome: White spot syndrome is a viral infection caused by whispovirus. The disease is reported to affect crustaceans such as lobsters, crabs, shrimp and crayfish – dwarf crayfish inclusive. It is characterized by the appearance of white spots on the outer shell of the animal. This is another lethal infection that can result in the death of a dwarf crayfish within days, and it is incurable. It evokes lethargic reaction in the affected crayfish; with their activity level dropping steadily. More so, with the disease manifesting, the crayfish will start to move slowly; this is a reflection of the weakness caused by the activities of the virus in the host cells. 3. Procelain disease: This is another fungal infection caused by thelohaniaspp, a group of fungi that has dwarf crayfish – as well as some other crustaceans – as primary hosts. Procelain disease results in muscular dysfunction in dwarf crayfish and death thereafter. This disease also brings about the whitening and hardening of muscles around the crayfish’s abdomen. Infected crayfish eventually become lethargic, and have a loss of appetite loss thus they do not get to eat as they normally do – so weight loss is also imminent. 4. Shell rot: This is also known as ‘black spot’ or ‘burn spot’ disease, and it is a bacterial and/or fungal infection. It may [or may not] lead to death depending on the severity. It is characterized by the formation of black spot lesions on the shell of the animal. The activities of the microorganisms lead to the gradual erosion of some portions of the shell, consequently bringing about the emergence of holes around the affected region. Apart from this disease deforming the structure of the dwarf crayfish’s shell, it could also hinder their full respiratory capability. And, with the outer shell giving way [due to the propagation of the disease], the underlying tissues are also susceptible to injuries or secondary disease(s). It has to be said here that leaving the water in the tank unhanged over a long period of time may present a breeding zone for the microorganisms that would eventually cause havoc to the health of your pet. However, unlike the other infections [discussed earlier] which are incurable, shell rot can be treated by giving the affected crayfish a salt-water bath. All you need to do is mix 4 tablespoons of salt in 0.8 liter of water – preferably, the water from the aquarium. You should use a container that is big enough to make the solution since you will be putting the crayfish into it. The crayfish will be left in the solution for about 8 – 10 minutes. Do bear in mind that you have to keep the water aerated by putting in fresh plants or air bubble stones. To achieve best result, you may need to repeat the process while observing the crayfish to take note of any improvement. Again, you should have the aquarium cleaned up. 5. Epistylis Infection: This infection may likely result from a situation whereby the dwarf crayfish is left to dwell in a habitat that is laden which considerably huge amount of organic pollution in which case, the water is basically dirty. The onset of this disease is in tandem with the formation of a fluffy substance on the outer shell of the crayfish. The infection hampers the crayfish’s respiratory organ from effectively optimizing available oxygen; this means breathing complication is very much likely to occur. From all that you have read on the diseases that may affect dwarf crayfish, it is obvious that most of the diseases are transmittable in one way or the other. This is why you have got to exercise caution when purchasing or hunting for a dwarf crayfish to introduce into a community that consists other pets. You should carefully watch out for any sign of infection before picking your choice pet. Such act will ensure that the life of the other aquatic crustaceans in the tank is not endangered. And one more thing: do not, at any point in time, compromise hygienic standard within the tank. On their part, dwarf crayfish could put up with any pet – but definitely not fry – as ‘co-tenants’ since they are not regular aggressors. However, the reverse is not always the case; this is why you have to be careful in selecting aquarium mates for your dwarf crayfish. Having said that, either of cherry shrimp, small swordtail or sparkling gourami should be an ideal companion to have around dwarf crayfish. Additionally, having snails in the same tank with the crayfish is never a bad idea. Snails could help in clearing up, to some extent, the waste deposited in the tank. Nonetheless, there are a whole lot of considerable aquatic organisms that should be able to share the same dwelling space with the dwarf crayfish without causing any harm. The key thing is to look out for an one that does not have aggressive and/or territorial tendencies, and such that do not have intimidating size. 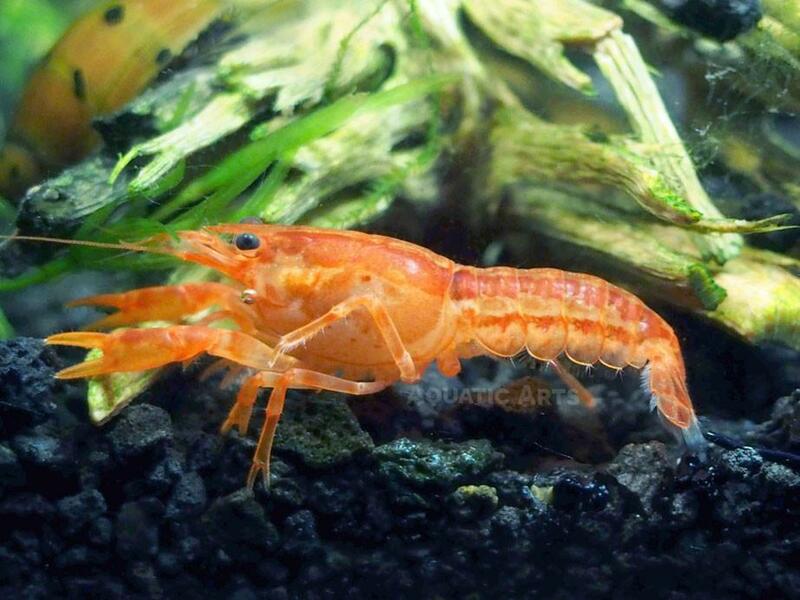 Dwarf crayfish are truly adorable and they will certainly add color to any home. But it is incumbent that you give them what they need to live out the rest of their days like it would have been in the natural habitat. Then, you can sit back and take pleasure in watching them evolve.